Join the rollicking gang of Rydell High for Grease Live!, an electrifying production of the hugely popular musical "Grease" – performed before a studio audience LIVE! Featuring a cast of today's hottest young stars including Julianne Hough, Aaron Tveit, Vanessa Hudgens, Keke Palmer, and Carly Rae Jepsen. With new music by Jessie J, Boys II Men, and DNCE, Grease Live! will reintroduce the unforgettable moments, classic music, and timeless love story to an entirely new generation. I watched this one on Netflix. It took me a while to write this review. Mainly because I want to give it a fair review for the show that it was... without comparing it too much to the movie. I know there has to be some comparison while watching but I wanted to review this on it's own merits. Some of the cast choices seemed odd to me. But others was right on. I felt Vanessa Hudgens did a wonderful job as Rizzo and Julianne Hough was good as Sandy... but that is about the best I can say about the cast. On one hand I thought it was a good homage to the film and I liked the live aspect... but on the other hand they made some choices that left me scratching my head. Even watching this version I couldn't help myself from thinking of Dawn. As much as she loved the original film and as many times as she made me sit through it... because of this the entire Grease franchise has a special place in my heart. My advice on this one... you are better off watching the original film. But if you must see it... there is worse ways to waste just over 2hrs of your time. Would I add this one to my collection? Maybe if I got it super cheap or free. But I don't feel the need to rush adding it. I just thought of something scary!... 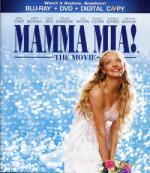 This month already I have watched more musicals then Danae Cassandra! Oh what would the reaction be (both here at home and online) if at the end of the month I end up watching more musicals then Danae Cassandra? So how are you dealing with it so far? Gag reflex not a problem so far? Once you start pulling out your hair, it's time to stop! OK so far.... I have a couple more watched... just need to write the reviews. Just very busy at work right now. Yankee Doodle Dandy will include "Warner Bros' Night at the Movies 1942" (Casablanca theatrical trailer, a vintage newsreel, the short "Beyond the Line of Duty," and the Looney Tunes short "Bugs Bunny Gets the Boid"). Other extras include a commentary from Behlmer and trailers for seven Cagney films;"James Cagney: Top of the World" biographical tribute hosted by Michael J. Fox; "Let Freedom Sing! : The Story of Yankee Doodle Dandy" making-of documentary; the Looney Tunes shorts "Yankee Doodle Daffy" and "Yankee Doodle Bugs"; the wartime short "You, John Jones" starring Cagney and Greer Garson; audio-only outtakes and rehearsals; the Oct. 19, 1942, Lady Esther Screen Guild Theater Radio Show with the film's cast members; and other material. This one while entertaining... will not be a favorite. I found it to be a little slow in parts and found myself waiting for the ending to come. I will say this I seen a different side of James Cagney in this one and I must admit I am impressed. Don't get me wrong I would say this one is worth the watch....and while I may add it to my collection at some point... it is not one I will be in a hurry to find. Shawn and Gus dive into a world that's equal parts mystery and melody to track down an escaped playwright mad man, Z, who six years earlier was deemed criminally insane after locking a critic in a back room of the theater that he burnt to the ground. Pretty much just an average episode here. Not so sure it deserved to be double length. Some of the musical numbers felt forced. This summer is gonna Rock! Get read to sing and dance as you experience the Disney Channel Original Movie Camp Rock in an amazing new way on Blu-ray Disc™! 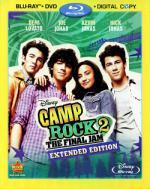 Check out awesome bonus features exclusive to Blu-ray, including the Camp Rock Set Tours! When Mitchie gets a chance to attend Camp Rock, her life takes an unpredictable twist, and she learns just how important it is to be true to yourself. Join the platinum-selling Jonas Brothers and the hottest cast of performers at the coolest summer camp anywhere! 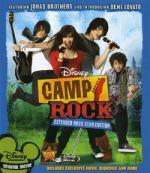 Experience Camp Rock at its best on Blu-ray Disc, complete with a pristine picture and theater-quality sound. Packed with hit music, hip dance moves and bonus features, Camp Rock will have you singing, dancing and rocking over and over again. I am a grown man that enjoys the Disney Channel Original Movies.... so sue me! I watched this one on Netflix. And I enjoyed it. I liked the concept... the cast did well.... and was enough to keep my attention through-out. I can see myself adding this one to my collection. Also noticed there is a part 2 on netflix as well... guess I will have to watch it also. Let's see... how's it going? Hey, I have to work! And run errands! And I had half my review written for Yankee Doodle Dandy when the power blipped yesterday. Yankee Doodle Dandy will include "Warner Bros' Night at the Movies 1942" (Casablanca theatrical trailer, a vintage newsreel, the short "Beyond the Line of Duty," and the Looney Tunes short "Bugs Bunny Gets the Boid"). Other extras include a commentary from Behlmer and trailers for seven Cagney films; "James Cagney: Top of the World" biographical tribute hosted by Michael J. Fox; "Let Freedom Sing! 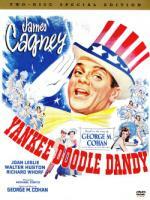 : The Story of Yankee Doodle Dandy" making-of documentary; the Looney Tunes shorts "Yankee Doodle Daffy" and "Yankee Doodle Bugs"; the wartime short "You, John Jones" starring Cagney and Greer Garson; audio-only outtakes and rehearsals; the Oct. 19, 1942, Lady Esther Screen Guild Theater Radio Show with the film's cast members; and other material. This is very much a film of its time. The display of patriotism and the classic American dream is absolute vintage WWII; a snapshot of a less cynical era. That's partly why Yankee Doodle Dandy hasn't aged as well as other films of the era. Cohen's songs come off as naive; his faith in his country innocent. Still, Cagney's performance is dynamite, and the film is worth watching just for him. Douglas Croft, who plays Cohen at a younger age, is also really great in his part. The song and dance numbers are fine, but the pacing could be better. As a biography, it makes Cohen a much more wholesome, clean-cut fella than he really was - reality is always complex, and the Cohen here isn't. Still, this is an iconic piece of 40's cinema, and worth watching for cinema enthusiasts. Get ready to ROCK with the biggest musical event of the year—now in an Extended Edition with never-before-seen scenes & songs! Join Mitchie (Demi Lovato), Shane, Nate and Jason (Jonas Brothers), and some brand-new campers across the lake for 2 times the music, 2 times the dance moves and 2 times the fun in Camp Rock 2: The Final Jam! Plus only this Extended Edition Combo Pack includes a behind-the-scenes introduction to the newest stars, music videos by Camp Rockers from around the world, and "Rock-Along," where you take center stage! Mitchie can't wait to go back to Camp Rock and spend the summer making new music with her friends and superstar Shane Gray. But the slick new camp across the lake, Camp Star, has drummed up some serious competition—featuring newcomers Luke (Matthew "Mdot" Finley) and Dana (Chloe Bridges). In a sensational battle of the bands, with Camp Rock's future at stake, will Camp Star's flashy production and over-the-top antics win out, or will Camp Rockers prove that music, teamwork, and spirit are what truly matter? This one iis a good follow-up. I liked where they went with the story. I the camp don't just concentrate on the music but also do traditional summer camp type stuff as well. I can see myself watching the Camp Rock films again. *1979 Best Supporting Actress, Kramer vs. Kramer; 1982 Best Actress, Sophie's Choice. After watching this one I found I have mixed feelings. On the one hand it is an entertaining story... and the entire cast did a great job. But on the other hand...I DO NOT LIKE UNANSWERED QUESTIONS! That and a couple other small things that bothered me. One being the loudness of all the songs. It is like they cranked up the volume for the musical numbers. By the time it was over I had a decent head ache. Either way... it is an enjoyable movie... I can see myself watching it again. But not in a real hurry to do so.